Sunday December 9th 1923 I had Mr Albers come and take me to church. Laura had taken the flowers for Will and had them arranged. They were very pretty. I gave some to Lizzie Duncan and Mrs Clark. We had callers in PM. Monday December 10th 1923 I worked at my bead bag part of the day. I went up to the C & A depot to talk about my trip south. It is 5 years today since Will left me. 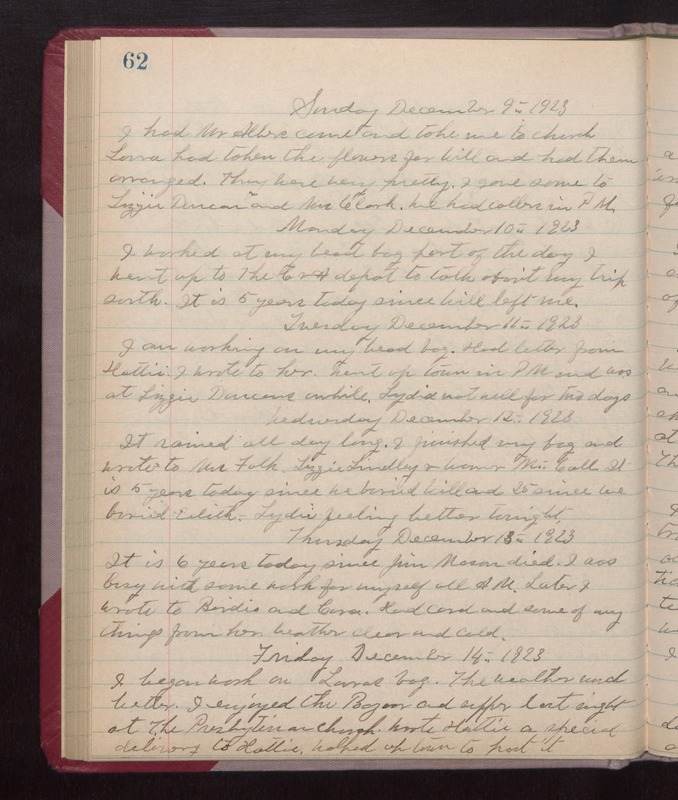 Tuesday December 11th 1923 I am working on my bead bag. Had letter from Hattie I wrote to her. Went up town in PM and was at Lizzie Duncans awhile. Lydia not well for two days. Wednesday December 12th 1923 It rained all day long. I finished my bag and wrote to Mrs Falk, Lizzie Lindley & Warner McCall. It is 5 years today since we buried Will and 25 since we buried Edith. Lydia feeling better tonight. Thursday December 13th 1923 It is 6 years today since Jim Mason died. I was busy with some work for myself all AM. Later I wrote to Birdie and Cora. Had card and some of my things from her. weather clear and cold. Friday December 14th 1923 I began work on Lauras bag. The weather much better. I enjoyed the Bazaar and supper last night at the Presbyterian church. Wrote Hattie a special delivery to Hattie. Walked up town to post it.